A 2014 report explains the development of a comprehensive land use plan that is based on the ecological values and functions of the Gorst Creek Watershed in southeast Kitsap County. The City of Bremerton and Kitsap County, in partnership with other state, federal, and tribal agencies, has developed a 20-year plan for the future of the Gorst Creek Watershed. The land use plan was developed based on a watershed characterization (Parametrix 2012) study performed as a joint effort between the City, County, the Washington State Department of Fish and Wildlife, and the Washington State Department of Ecology, utilizing grant funding provided by the U.S. Environmental Protection Agency. The purpose of this land use plan was to assist the City and County in long-range land use planning for the basin. The Gorst Basin has historically been underutilized and remains largely undeveloped. Based on the high level of undeveloped land, the City and County sought to plan future growth based on the desire to protect habitat and water quality to the maximum extent practicable, while at the same time encouraging growth within the UGA. The watershed characterization was used to determine where growth should occur based on this premise. Based on the results of the watershed characterization, the City and County selected areas for increased development, restoration, and protection. As growth is projected 30 years into the future under this plan, the need for capital infrastructure and stormwater code requirements were included in the land use planning process. Stormwater management was identified as the primary capital need, based on the topography, soil type, and the common occurrence of flooding within the area. This modeling effort is intended to develop an understanding of stormwater infrastructure needs and costs and the results of this effort will be adopted into the City’s existing capital improvement plan to improve the stormwater management strategy. This work will be used to refine the existing guidance the City and County apply for planning capital improvements as the area develops, and to determine the relative effectiveness for controlling excess flow through the use of low impact development best management practices (LID BMPs). City of Bremerton. 2014. 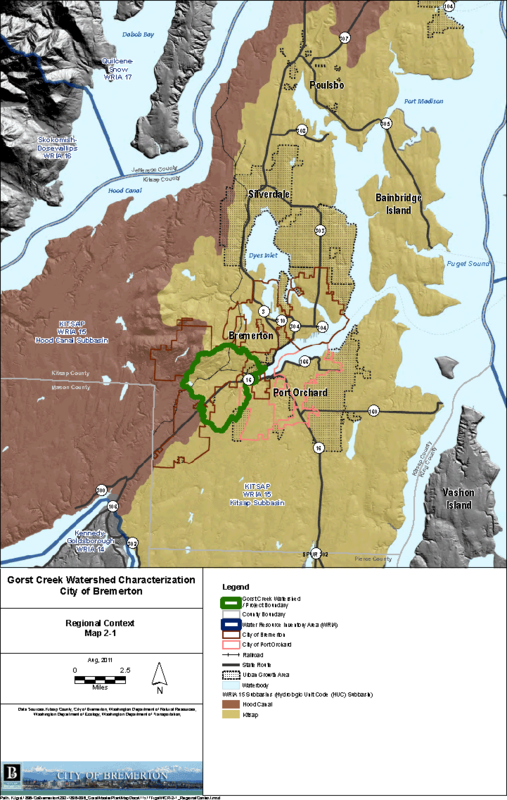 Comprehensive Watershed Plan for Sustainable Development and Restoration of the Gorst Creek Watershed. Environmental Protection Agency, Lacey, Washington.